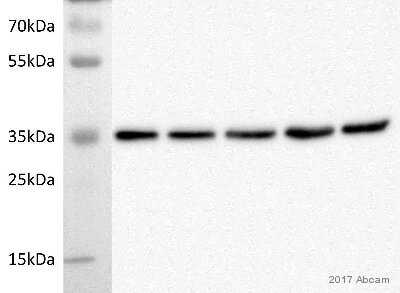 This antibody can be used as a loading control antibody, however we also recommend ab9484 as an alternative. GAPDH is a 146 kDa tetramer composed of four 30-40 kDa subunits. There is no cross-reaction with GAPDH from yeast. Preliminary data indicates that the antibody recognizes the monomer (36 kDa) and also the dimer forms of GAPDH, but not the tetrameric form of the protein. Our Abpromise guarantee covers the use of ab8245 in the following tested applications. Fluorescence detection of secondary antibody. ab8245 staining GAPDH in SV40LT-SMC cells. The cells were fixed with 4% formaldehyde (10 minutes), permeabilized with 0.1% Triton X-100 for 5 minutes and then blocked in 1% BSA/10% normal goat serum/0.3M glycine in 0.1%PBS-Tween for 1 hour. 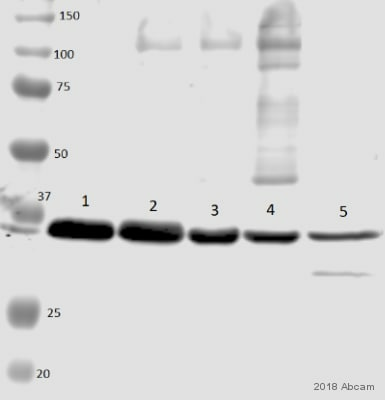 The cells were then incubated with ab8245 at 5μg/ml and ab202272 at 1/250 overnight at +4°C, followed by a further incubation at room temperature for 1h with Goat Anti-Mouse IgG H&L (Alexa Fluor® 488) preadsorbed (ab150117) (shown in green). Nuclear DNA was labeled in blue with DAPI. Observed band size: 36 kDa why is the actual band size different from the predicted? ab8245 staining GAPDH in NIH/3T3 (Mouse embryo fibroblast cell line) cells. 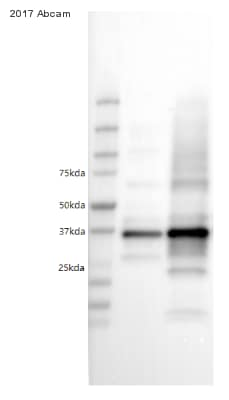 The cells were fixed with 4% formaldehyde (10 minutes) and then blocked in 1% BSA/10% normal goat serum/0.3M glycine in 0.1%PBS-Tween for 1 hour. The cells were then incubated with ab8245 at 1 μg/ml and ab202272 at 1/250 overnight at +4°C, followed by a further incubation at room temperature for 1 hour with Goat Anti-Mouse IgG H&L (Alexa Fluor® 488) preadsorbed (ab150117) (shown in green). Nuclear DNA was labeled in blue with DAPI. ab8245 staining GAPDH in HeLa (Human epithelial cell line from cervix adenocarcinoma) cells. The cells were fixed with 100% methanol (5 minutes) and then blocked in 1% BSA/10% normal goat serum/0.3M glycine in 0.1%PBS-Tween for 1 hour. The cells were then incubated with ab8245 at 5 μg/ml and ab6046 at 1 µg/ml overnight at +4°C, followed by a further incubation at room temperature for 1 hour with Goat Anti-Mouse IgG H&L (Alexa Fluor® 488) preadsorbed (ab150117) at 2 μg/ml (shown in green) and Goat Anti-Rabbit IgG H&L (Alexa Fluor® 594) preadsorbed (ab150088) at 2 μg/ml (shown in pseudo color red). Nuclear DNA was labeled in blue with DAPI. 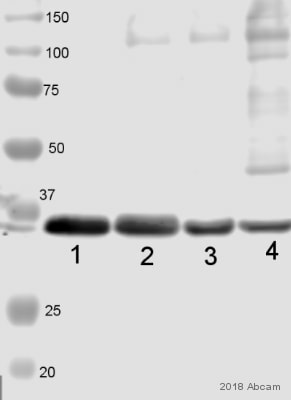 Negative controls: 1– Rabbit primary antibody and anti-mouse secondary antibody; 2 – Mouse primary antibody and anti-rabbit secondary antibody. Controls 1 and 2 indicate that there is no unspecific reaction between primary and secondary antibodies used.